Dr. Vequist was one of the first academic researchers to focus on Medical Tourism and now boasts a robust slate of research on the business and markets of Medical Tourism. His experience includes: keynote speaker at conferences worldwide; a featured author with many papers and articles about medical tourism trends; interviews in a variety of media around the world; founder and co-Editor of the first academic journal devoted to Medical Tourism (starting this year); Chair of the first ever Medical Tourism Research conferences; and leading researcher on several projects for countries, regions, facilities, and providers. In the past, Dr. Vequist was an executive with HCA managing the human resources for a large subsidiary (Methodist Healthcare) in San Antonio, Texas, USA and prior to that was a consultant with Ernst & Young LLP. Dr. Vequist is currently expanding his research on the impact of Health, Wellness, Dental, Medical and Retirement Tourism. Dr. Teachout has focused his research on the training systems utilized by healthcare organizations. Dr. Teachout is also the Associate Editor for the International Journal of Behavioural and Healthcare Research (IJBHR) and the editor responsible for the first ever Special Topics Issue regarding Medical Tourism. Dr. Kiser has researched the ethical implications of medical tourism and accessibility issues in medical tourism travel. She is also interested in the impact of technologies on medical tourism travel. Dr. Moreno has just recently started to research the financial reasons for medical travel. He will be presenting at the upcoming 2013 European Research Symposium. Christine is working on her B.S. 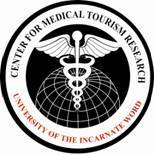 from UIW, helped with the 3rd Annual Medical Tourism Research Conference and is assisting with the 2013 European Medical Tourism Research Symposium. She is the author of a Medical Tourism Today article and is interested in the wellness tourism industry and the future of spas. Brian graduated from UIW with his MHA degree and now is pursuing a Ph.D. After serving his country in the military, Brian joined as a research assistant of the Center after attending the 1st Annual Medical Tourism Conference, and then assisted with the 2nd Annual Medical Tourism Conference and spoke at the 3rd Annual Medical Tourism Conference. He is co-author of a Medical Tourism book chapter and will be speaking at the 2013 European Medical Tourism Research Symposium. He is interested in the business models underlying Medical Tourism, the impacts of Centers of Excellence, and video advertising of healthcare providers. Eduardo joined Valparaiso University as a JD/MBA student in 2012. He helped to make the 1st Annual Medical Tourism Research Conference a success and spoke at the 2nd and 3rd Annual Medical Tourism Research Conferences. He is interested in the legal and ethical impacts of Medical Tourism. Erika graduated with her MBA and was the first research assistant of the Center. She is co-author of several Medical Tourism articles and has presented on Medical Tourism trends to a Fulbright Conference and spoke at the World Medical Tourism and Global Health Conference. She is interested in the economic impact of Medical Tourism and the extension of the continuum of care for medical tourism patients.